We all know I'm a sucker for cake! Sponge, carrot, cheese you name it I'll eat it. But chocolate cake just has a special place in my heart. Every year my mum (to this day) ask what type of cake we would like and bless her, she pulls through every year. This year I said "chocolate and salted caramel, go wild" and I think she found the best recipe yet. Today I'm sharing my birthday cake from last week thanks to Ashley from Bake by Nature. Now don't be scared off by the massive amount of ingredients I assure you, you will find most of them in your pantry already. Ok ready to make the worlds best cake? Lets do it! Preheat oven to 350°(F). Cut out three 9-inch round segments of parchment paper to line your cake pans with. Spray each pan generously - sides and bottom - with nonstick cooking spray, then place the parchment paper cut out in the bottom of the pans. In the bowl of a stand mixer fitted with the paddle attachment, or in a large bowl using a handheld electric mixer, combine both sugars, flour, cocoa powder, baking soda, baking powder and salt; mix on low until dry ingredients are thoroughly combined. In a stand mixer fitted with the paddle attachment, cream the softened butter on medium-speed until completely smooth; about 3 minutes. Turn the mixer off and sift the icing sugar and cocoa into the mixing bowl. Turn the mixer on the lowest speed and mix until the sugar/cocoa have been absorbed by the butter. Add in vanilla extract, salt, heavy cream and salted caramel; beat for 3 minutes. Using a serrated knife, carefully trim the raised top of each cake, making each one an even, level surface. Transfer 1 layer to a large plate or cake stand. 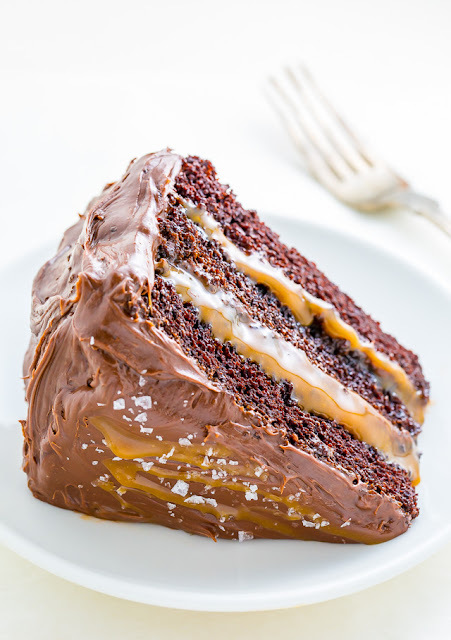 Spread a thin layer of frosting on top, then add a 1/2 cup of caramel; top with another cake layer, and repeat, thinly spread it with a layer of frosting, then adding a 1/2 cup of caramel. Top final cake layer and place cake in the fridge to set for 1 hour. Once set, finishing frosting the top and sides of the cake.